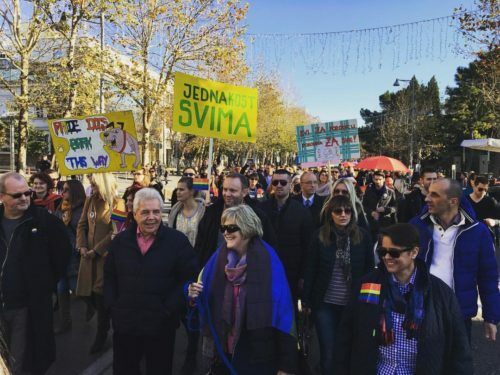 POGORICA, Montenegro (AP) — Dozens of people participated in a LGBTQ pride event in highly conservative Montenegro where authorities are promising to boost gay rights as part of efforts to join the European Union. Activist Danijel Kalezic says Montenegrin gays no longer want to hide. “We don’t have enough support from our fathers, mothers, siblings or relatives,” he said. Montenegro’s government has announced plans to introduce gay partnership as part of its pro-EU agenda. Montenegro, like much of the Balkans, has a strong macho male culture with little tolerance for gays, who often face harassment or attacks from right-wing or hooligan groups. Initial pride events several years ago were marred with incidents.